How To Get A 1800 Number For My Business Today That’s Easy To Setup? What’s The Best Toll Free Number Service For Small Business With Unlimited Extensions and Personal/Cell Phone Integration When Out Of The Office? What Is The Best Toll Free Number Provider That’s Cheap And Reliable? Should I Used An 800 Number Forwarding Service For My Business? Or Get Vonage VOIP With Toll Free Line? What Is The Best Way For A Startup To Get A 1-800 / Toll-Free Number? What’s The BEST And CHEAPEST 1-800 Service Out There? As a fellow business owner, it’s hard when you search online looking for the best 800 number service for small business use, and you don’t know who to trust. Everyone is always trying to sell you something, but you just want good reliable service, at a reasonable price, so you can get back to growing your business right? Some sites seem to have “reviews” of 800 services, but have they actually used them? As a web services business owner over the past decade, I’ve used just about every virtual 800 number service out there for myself and for clients. There are pros and cons to each provider, but this article will show you a no-nonsense list of good providers to get your 800 number from… without contracts, and without breaking the bank, and without stupid contracts like a landline service. In the quick list above, you’ll see notations about each provider. What most companies and other phone provider review sites never tell you, is whether or not they support phone hardware. Why is this so important? Well, if your business is growing rapidly, and you start out with a single location or no location at all when you’re bootstrapping, some providers are going to be very difficult to expand with if they don’t support phone adapters and physical phone hardware. If you’re a traveling salesperson or a digital entrepreneur, you won’t have to worry about this much… typically an 800 line straight to your cell is all you’ll ever need. But for local service based businesses, or physical location businesses that may expand, trying to save $20/mo now, will cause you a huge headache later. To give you a specific example of which providers will and won’t work well for both scenarios, Grasshopper is the best choice for getting an 800 number on your mobile, and RingCentral will do the same, but is way more robust and lets you add pre-programmed office desk phones at any time to your account. It’s now easier than ever to setup an 800 number for your business, and you can easily add a toll free number to your cell phone or office line on the cheap with one of these voip services I use for clients. The main thing you need to know is, what’s the difference between a forwarding service vs. a business voip phone provider. Both are cheaper than adding a toll free number to your existing landline plan, but toll free call forwarding services simply add business phone functionality to your existing cell phone (grasshopper has a cool app for that), and a business voip service will give you the ability to add office phones, softphone apps, and advanced 800 line features like call recording to your plan. We’re all budget minded these days, so I would expect you’re looking for the best inexpensive 800 number phone service provider for your small business? In this article, we’ll go over the top 5 best 800 number service providers, and which one’s offer the cheapest price, the most minutes/unlimited minutes, and even which plans let you do call tracking for your advertising. By the end of this article, you’ll be able to decide which toll free 800 number phone service provider is right for you. I know you probably don’t have a lot of time, and you just need to know quickly what the best 800 number provider is for your needs right… Any of the recommended providers above can give you a custom toll free vanity 1800 number, but the functionality and features that the backend of some of the voip services are different.So I just want to touch on those for just a second, to make sure you pick the best option for your business needs. For example, Grasshopper is the best choice for most people, but it is really a number forwarding service at it’s core. They do have their handy smartphone app that works like a charm, so if you’re looking to add a toll free business line to your cell phone, or simply don’t want customers of your weekend side hustle getting your home address/caller id or getting your personal cell phone number, Grasshopper is a great solution for that. However, if you know you’re going to have office phones, or want to use a softphone app to take and make calls from your computer, you’d be better off going with a provider like Phone.com or Ring Central which I’ll go over below. You’re going to pay a little bit more, but you’ll save yourself the hassle of having to switch providers and port your number over when you do get multiple offices. If you run a service business, or know up front you won’t have secretaries anytime soon, save yourself some money and go with Grasshopper’s business forwarding phone service. Just keep in mind, a call forwarding service is just that… A service that lets you buy a business number (in this case a toll free 1-800 line) and receive calls on your existing cell or office phone. A business voip provider has more advanced features like complex call routing to multiple numbers, typically offers unlimited minute plans, can support unlimited extensions and additional phone numbers/lines, offers voip phone hardware, conference calling, etc… In a nutshell, that’s the main difference between an 800 number forwarding service, and a true business voip service that let’s you add an 800 number to your plan. In general, most people and business owners will never use half of that, and 9 times out of 10 are perfectly happy with a phone service like Grasshopper, making them the best 1 800 number provider for most people. The good reviews speak for themselves as well! How do I know about these services? I’m going to go over a few of the pros and cons of different 800 number providers, and specifically how particular companies can be a tremendous help if you’re actively doing offline advertising, online advertising, or have commission sales agents. Please understand right up front, that for large corporations that require landlines hardwired into the building to piggyback/operate other systems off of, these are not intended to be a replacement for those, just a helpful addition to track various performance aspects and drive more revenue. Most people/companies do not ever consider using call tracking to monitor the effectiveness of contractors they hire to do both online and offline advertising. This can be both a life saver to identify poor performance, and a branding nightmare if used incorrectly, so we’ll cover this in great detail. Finally, we’ll go over an alternative to using an expensive virtual phone service provider with a live answer receptionist. I’ll show you how you can setup a professional call flow from two different companies that doesn’t require an employee to sit by the phone, but also doesn’t make the customer feel alienated or give the impression you may not be very responsive. This can save you boatloads of money compared to a VOIP system from a local service provider like Brighthouse/Time Warner, Century Link, Comcast, ATT, Verizon, etc… The only downside is, if you utilize a ton of outgoing minutes that must originate from the same number, most plans aren’t unlimited until you get into the higher cost packages. We’ll throw in a few tidbits on how this all ties in to lead gen campaigns, SEO, hiring PPC advertising specialist, billboard advertising, and more. By the end of this article, you should have a good grasp on which service will be the best fit for you or your company. But should you have a question that I didn’t cover, ask below in the comments and I’ll answer it within a couple days… There’s probably someone else out there with the same question, so you’ll help them out too! I get this question a lot, so I wanted to put an update in here to walk you through setting up an 800 number for your business in 10 minutes or less. I totally understand too, there’s a bunch of you that are starting side hustles and local service businesses that don’t want to give up your personal cell phone number or caller id to customers. I get it, it’s not very professional number one, and number two, who wants customers to be able to Google your home address right?!? You will be able to use your business line the same day, and there’s no waiting for a phone company to set anything up. The reason I mentioned the online control panel, is because it’s awesome… You can log in, change your custom greeting, add departments or employees for that professional big company feel if that’s what you’re going for, and change how your calls are routed with the click of the mouse. This automatically syncs with the Grasshopper phone app on your cell phone, so you can easily decipher between personal and business calls, and only answer them during regular business hours. The Grasshopper phone plans that let you do this are some of the cheapest out there, and are very affordable and flexible… still to this day offers the best price toll free number in the industry. Grasshopper has the most robust and flexible call flow setup of any of the forwarding service providers, and offers the most support for expansion so you’re not stuck with a limiting service if you expand down the road. They make it easy to setup your desired call flow, and even forward calls to cell phones or other numbers after a customer has selected an extension. You can choose to add new lines to your account at any time, and also keep your existing or local number too. Conference calls are a breeze, and it automatically connects all parties by entering in their phone numbers. Save time by adding an informational extension that delivers automated store hours and directions to customers in real time. 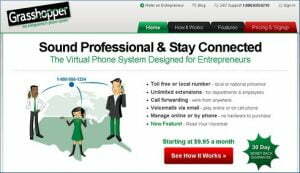 However, Grasshopper does not have advanced features like call recording, softphone applications, etc… And you’d be better off going with a complete virtual business phone service, such as Phone.com, like I mentioned above. How would you use these phone services the way I described above? Well let’s create an example here, and say you don’t have a receptionist, but still want your customers to be greeted properly when they call, and directed to the correct department or employee/person right? This is easy to do, and you can record multiple greetings for your primary initial call greeting, add extensions with a menu that the customer can select (with or without hold music), and then add secondary greetings further down the call flow path. (you can also create a name directory if you want customers to be able to search through personnel as well) Forwarding a customers to call to multiple numbers is a perfect way to handle an employee not being available, and the customer isn’t immediately alienated because there are secondary call flow options they can be routed to should that employee not answer. You get the ability to setup multiple custom voicemails, and then choose how those are delivered to you. Great options that will save you time from checking messages when you’re busy are voicemail to email, and even faxes to email… so you don’t have to run back to the office every time a client sends you over a fax! Both can be transcribed and added to your emails, so you can quickly see what the call was about. For service businesses who use their cell phones all the time and are expanding, Grasshopper makes it super easy to set your outgoing caller ID. This way it no longer shows the personal name and address associated with your cell phone, and it much more professional since it’ll match your company info exactly. Business SMS text messaging is also a nice feature, and in this day and age is a good idea for most businesses to have the ability to accept text messages. The other thing that makes Grasshopper attractive is the low startup costs involved. Their pricing starts at $12/mo, and you don’t have to buy and expensive phone hardware or voip systems since it’s a virtual phone system. If you’re going to hire an advertising company to run billboard ads for you, how do you know exactly how many calls you get from that exposure? Does it lose you money or break even? Do you know for sure?? One of the ways to position yourself to better analyze how much you spend, or which contracts to renew, is to track your calls. Instead of using you main office number, you buy a local or 800 number from one of the providers I’m about to introduce you to, and monitor every call that comes in on your end of the month report. There’s an additional pro to this that can put you many steps ahead of your competitors. One is call recording, whereby you can see how well your receptionist is doing taking the calls, how well your sales agents are closing, and easily spot areas to improve by doing weekly quality control checks. You’d be surprised by how many businesses are losing business from improper greetings by receptionists and employees. You just never know about it unless you deploy a technique like this. There are a couple of cons to using a call tracking line for everything however. For instance, if you have a branded vanity phone number, and you’re doing a national ad campaign, you would not want to use a separate call tracking line in this case simply because you’ll lose the brand recognition. Another case where you’d want to be careful, is using a call tracking line to track how well an SEO company performs for you. You want to be sure they deploy your numbers as an image, not raw text so your NAP doesn’t screw with your local SEO. However, if implemented properly, you can quickly see where your company is losing money each month, and where to scale up in places that delivers your best return on investment. Once identified, you no longer need to use these numbers any longer, and can ditch them aside form testing new advertising methods. If you’re just looking for a cheap 800 forwarding service that still has inbound call analytics, Grasshopper is going to work great and cost less than $15 bucks a month, which is super affordable. 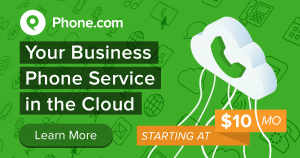 As long as you don’t need any advanced office phone features for your toll free line (like you’d find with phone.com voip phones), that’s the most economical way to go for most business owners. Callfire used to be my top choice here for billboard advertising and local mag drop tests, mostly for it’s huge number selection (you might even find a second vanity number as well) and affordability. But, after getting into numerous situations where you can’t get email notifications aside from the primary account ownership email, I now use Phone.com for all my new lines for this purpose. You can be setup in 5 minutes, and receive texts and forward them to whatever number of your choosing. Turning on call recording and voice whisper (so your receptionist knows where the call is coming from if you have a special greeting for certain circumstances) is a click of the mouse, and you can easily record custom messages that only you can hear. Full compliance no matter what your state regulations are are available, including call announcements on your customers end if you happen to be recording entire conversations for quality control. At the end of the month (or anytime really) you can log in to your dashboard and listen to how well your staff is doing, see how many calls went unanswered, and view caller id reports to see how many times the same customer had to call to get the service they desired. Second on my list for call tracking providers, is Phone.com. They actually are my favorite, but cost a bit more, and are not always cost effective for every situation. However, the features are on par with Grasshopper in regards to what you can do under the hood, and it’s very easy to setup custom call routing/forwarding and have your voice-mails transcribed and emailed to you instantly. In addition to this, you can get email notifications every time a call is transferred, so if you;re tracking an ad campaign by the day or hour, it’s easy to get a feel for what’s working and what’s not. Usually most business owners will go online and search in Google or something for “how to get a 1 800 number” to see what other people are using. What they don’t know, is there are two types of available 800 numbers… the standard open pool, and the premium pool. The only way to get a premium custom 1-800 vanity number, would be to lease if from a company like RingBoost. You might pay a little more, but the advantage here is that you can usually get a variation that will match your business name perfectly. Now the open pool of numbers available with any 1 800 number provider, are kind of like open domain names that haven’t been registered… Not all bad, but because they’re available, you have no guarantee what type of businesses they’ve been used for in the past. The #1 mistake that most people make, is not googling the toll free number they’re about to buy before checking out, just to make sure it hasn’t been used for any shady business in the past. Ideally, you want a number that has a clean history, or no history at all so you can start with a clean slate. I’ve seen this happens a few times, where business owners didn’t catch this until it was too late, so make sure you Google your 800 number three ways: in quotes — “800-my-number,” with and without the “1,” and with parenthesis/area code style — “(800).” That should bring up any previous listings associated with that number, if any, and let you be sure the number itself wasn’t used for a local massage parlor or something. If you’re spending money with ongoing online ad campaigns, and you want dynamic number insertion to track conversions down to the exact landing page and referrer, Ifbyphone is bar none the best phone service provider for you. Their advanced applications and tracking allow you to setup campaigns in ways other companies can’t support yet. The ability to split test, both ad copy with direct phone extensions and landing page variations with different CTA’s, is second to none compared to other providers I’ve used. The only downside to IfbyPhone is the costs involved for normal call tracking without needing some of these features… You’d be better off with Phone.com if you aren’t doing heavy digital advertising. Update – haven’t used IfbyPhone since they switched to Dialog Tech after a round of funding it looks like, but if you’re doing strictly a ton of PPC, their dynamic keyword insertion and tracking is the best in the business. Kall8 is a company I started using many years ago before Grasshopper was around, and still have an account with them today. Their pricing isn’t the cheapest, but still a good value for that their system can do, and they have all the advanced features like VOIP integration, payphone blocking, call announcements, address lookup for caller id, lead management, and hunt groups. I’m pretty sure Grasshopper has now evolved to offer all of these features and more at this time, and is probably the more favorable choice if starting fresh. But Kall8 still makes the cut… My only complaints about kall8 are the clunky interface. They’ve been rock solid for me for the last 4 + years, and I still have multiple lines with them. However, they don’t make it as streamlined to setup new campaigns and adjust things like call recording and whatnot, along with limited voice whisper features. Be sure if you’re running campaigns with an active spend, you have a backup card on file. Late last year my numbers were suspended because my credit card expired and I was out of town, and didn’t get their courtesy call reminding me to update payment. I’ve used Twilio in the past successfully for lead gen campaigns for clients and whatnot, and don’t get me wrong, they are VERY affordable. Probably the cheapest in the business, if not beating other companies by a long shot! But there are a few caveats about them that stop me from recommending them for most businesses. The big one is call quality… Sometimes their lines can be quite staticky, and the connection speed seems to have a lag at times, but other than that, their network is rock solid. In terms of customization and what you can build on top of their platform for custom autoresponders for customers, there is no comparison. The biggest reason they didn’t make the list since you sort of have to be a programmer to work with their api, or subscribe to a third party software company/license to integrate with it. This isn’t a huge deal, but I don’t like having an additional point of vulnerability between the primary service provider in case of failure… The whole operation could be compromised until a patch or bug fix is pushed out, which isn’t acceptable to me when your business is on the line. The most flexible is going to be Grasshopper since they have an Iphone app that allows you to ingrate and control certain aspects of your phone system, with Phone.com being a close second. Phone.com might be a little bit cheaper in the beginning, but Grasshopper will have you covered for more future expansion, and it’s likely you’d never have to find another toll free provider after that. In my opinion, the cheapest is going to be Callfire right out of the gate. It was my go-to cheap number provider for many years, however I don’t use them for new numbers anymore since the notification systems aren’t setup for true multi-business setups under one account. For most small businesses, it’s not the right fit either. I also wouldn’t pick them if I planned on keeping office phone systems integrated for the long haul, I’d go with Grasshopper instead. Reason being, Callfire’s dev tech is aimed toward a niche in the market that includes voice broadcasting. That’s kind of their thing, and when I’ve called customer support before and asked about implementing advanced features, the feedback wasn’t positive in that direction. For that reason alone, for most small businesses, the best provider is going to be Grasshopper. They offer the best all around feature set, with future development looking to support a variety of applications. In a close second, is Phone.com. I absolutely love their service, and the ease of which you can setup lines for businesses and route the calls for lead generation campaigns is just awesome. If you’re looking to track ad campaigns, or experiment with new lead sources as opposed to running office lines, I’d go with Phone.com. Their pricing is still attractive, and if you look around at any other reviews or comparisons, you still get all the advantages over going with a local provider like Verizon or ATT for example. The only mistake I’ve made in the past when buying an inexpensive business line (whether for myself or a client), was not considering the company’s/platform’s future flexibility and what I’d need. If you’d like to get a vanity phone number for your business, (I would recommend choosing something easy to dial/remember if possible!) Grasshopper makes it very easy to search the available custom toll free numbers. Simply select your desired prefix (800, 888, 877, or 866) and then type in your business name and hit search. A lot of the more popular vanity numbers will be taken, but a lot of time you can generate a variation of your business name abbreviation and it’ll be available. Try it out for your business name here. 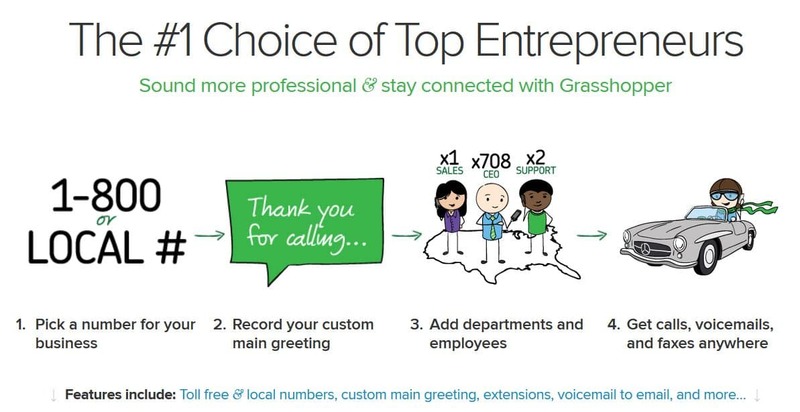 For most small businesses, the best 800 number service provider is going to be Grasshopper. The only situation where I don’t recommend them as the first recommendation, is if you have the need to record your calls to spot check secretaries, or do billboard advertisement analytics and whatnot. Then Ring Central or Phone.com would be your next best options as the best 800 number service for small business. Grasshopper or Phone.com both start around $10/mo and regularly have discount coupons and free trials. This is a tough question answer without more details about your business needs. On one hand, a cheap 800 forwarding service is almost always the go-to choice for most small businesses, but the only potential future issue I see that could arise is when/if you want to have an office/multiple offices. 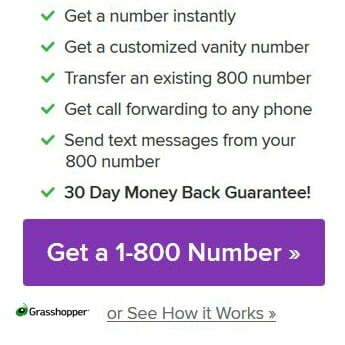 But like I always say, if you’re like most people out there, and just want to know how to add a toll free business line to your cell phone, Grasshopper is a great way to go for a cost effective 800 number solution. As far as the original question is concerned, a lot of the virtual phone service providers now are fairly close in terms of price/performance/etc… As a small business owner, you really need to know what features are your MUST-HAVES, since certain platforms lend themselves better for different things.For instance, Callfire is definitely the cheapest provider I use for local and 800 lines for billboard ad tracking, but they’re not a true complete virtual number provider in that, their backend has a limited feature set when it comes to setting up smartphone integration, voicemail to text/email, and so on. But for a basic number to do call tracking with, or an additional line for an advertising campaign, they work great and are by far the cheapest.On the flip side, Phone.com and Grasshopper are way easier to setup in every possible way, especially when it comes to recording greetings, forwarding numbers, texting, etc… Not to mention the iphone apps so you can easily take your calls and phone system management with you on the fly. These forwarding services would be much better options for most businesses looking to add a toll free 1-800 number to their phone plan.Additionally, if you want to use office phones or add voip desk phones, I’d go with Ring Central or Phone.com specifically… That way you won’t have to get a phone adapter or do anything crazy to set it up, it’ll just work and be pre-programmed right when you receive the device. I’ve used Kall8 for many years, and am still a customer to this day. I have some client call tracking numbers there that we can’t get rid of, and I’m too lazy to switch to another provider. Service has been rock solid, but the main reason why I don’t recommend Kall8 to most people looking for an 800 number service, is because the control panel is dated and more difficult for a newbie to setup. They also don’t have things like Grasshopper’s custom voice studio, which is something a lot of customers are looking for to get custom voicemail greetings made for each of their toll free lines. I haven’t used Freedom Voice, so I can’t comment on that provider, but I would recommend looking at buckets of minutes/unlimited minute plans/pre-paid minute plans instead of using services that charge you by the minute. What Is A Toll Free Number & How Does It Work? Hi I own a small local contracting business and we’re going to be trying an advertising package in a local magazine. They have an upsell that gets us coverage on some local billboards owned by one of their partners. Do you think I should use one of these services for that and keep our ad the same? Or no just use our main business number for everything? Just don;t know how we can track what works is all. Thanks! Hey CJ, sorry it took a few days to respond… Been traveling. But to get you by, if this is something you’re buying this month, what I would do is use your main line for any long standing advertisements. Meaning, you want your ACTUAL business line to be listed in Yellow Pages, directories, etc… And use a dedicated call tracking number for each temporary advertisement. So to clarify, you always want your main business number for any business listing details, and then use a separate call tracking number for your magazine package, and then another separate number for your billboard test. This way, you can log in at the end of the month and see which one generated which appointments, etc… Keep in mind that some is luck of the draw (not every job can be a whale ya know, sometimes it’s coincidence on how they come in). Hope that helps. I’ll have a couple blog posts coming out in the next few weeks that’ll go into more detail on this. Just reply here if I didn’t answer something or you get stuck and I’ll respond within a day or two. Good info, but I’m not sure which 800 service is the best fit for what I want to do? I’m starting a side business this winter and eventually become a full time electrician. But I don’t want to limit myself to one county in my state, so I was thinking of using a toll free number instead of local area code. WHat do you think? What’s the best 800 service provider for my situation since I’ll pretty much always be working out of my truck or at my customers location? Thanks! Hi John, this sounds like a perfect fit for Grasshopper phone service. If you just want to be able to have a business line on your mobile, Grasshopper is the way to go. If you think you’ll get an office too, where you’ll be working out in the field and have another employee in the office taking calls as well, Ring Central is the way to go for that. They have a smartphone app just like Grasshopper, but in addition they have a softphone app (software that runs on your computer) that would allow anyone in the office to also connect to the business line. I definitely agree with you on going with a toll free 800 number for your business in your case… that way customers don’t automatically associate you with a limited service area, and you can always add another local line pretty cheap for any are you want later on. Matt do you know if I can use a phone adapter with Grasshopper or Ring Central to add a 800 line to our office? We’re a small mom and pop operation, and the price we were paying for our local phone service was over $200 a month. We since cancelled that, and just use our cell phones, but we really should have a dedicated business line. I figured since we weren’t able to keep our old number and had to get a new one anyway, why not get a 1-800 number. I like the starter price of Grasshopper and I think it has all the features we will need, I’m just a little worried about not being able to answer calls if we forget our cell and are at the office. 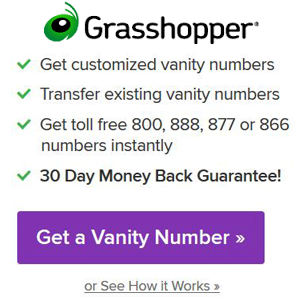 Do you know if I can buy a phone that will hook up somewhere and connect to our Grasshopper toll free 800 number? Hi Mary, I think I understand everything you want to be able to do. Grasshopper is really designed to work with your cell phone using their smartphone app and the online control panel. However I suppose you could get a VOIP phone adapter (or like a Cisco brand voip telephone) to integrate with it. However, if you really need that much flexibility, I would recommend you go with Ring Central instead since they let you lease up to date hardware for $10-$20 bucks a month (no contract). If you click here and go to Ring Central, click on Products > Phones & Headsets, you’ll be able to see tons of options for an office phone system. Like I just mentioned in the above comment, they also have a softphone app that will work on any laptop or desktop PC or Mac, and you don’t really have to buy or lease a VOIP desk phone if you don’t need it… A simple headset that connects to your computer will have a decent microphone on it. I expect to be on the phone 10 hours a day, a combination of connecting with leads and the resulting conversations…my research tells me that minutes from outgoing calls (i.e. voicemails) will probably exceed the those from the actual conversations. If you want to use your cell phone, the #1 thing I would do is pick a provider with a smartphone app… Otherwise you’ll be reliant on voice whisper messages to identify each line (to know how to answer if you have multiple campaigns going) if you’re limited to forwarding to one mobile device. Not a huge deal, but every little bit helps once you get knee deep into steady lead flow. An example of this would be if I had a roofing lead gen client, and we wanted to A/B test two different company profiles/ads/landing pages/USP/national brand vs local/etc… I’d have two side by side “companies” competing with each other. If you have 10 campaigns going, that can be very useful. However, it sounds like as a one man band you’ll have a specific virtual voicemail setup for any line you have, since you’ll be on the phone most of the time and won’t be doing as much live answering. So this might not matter to you or be a big deal, just thought I would give an example because this info/situation can be hard to find if it comes up later. Based on what you said about a pre-recorded greeting with matching voicemail, I would not go with Grasshopper in this case, which is who I normally recommend for cell phone users. The other thing that concerns me is the high number of outbound minutes you’re going to use… You can easily rack up a few hundred per month on the wrong provider. I’d go with an 800 service that has an unlimited minutes option like Phone.com. In fact, in this case, Phone.com is who I’d recommend you use specifically. They’ll treat you right, and I’ve used them successfully for exactly what you want to do and more. And at any time, you can pay for their add-on unlimited minutes package for $25/mo, which should save you some money when you’re up and rolling. I don’t remember if I mentioned this somewhere or not, but always, always, always, ALWAYS!!! google the number before you buy it when you’re doing a number search, especially 1-800 numbers. You want to make sure it’s not one that’s been used by a call center or automated IVR/SMS blasts with tons of complaints all over the internet. To your first question, I’ll be in the franchise consulting business. So net net I’m buying leads from the company (and can use 3rd parties based on the quality) and work those to conversion from my conversation to the franchisor(s) of choice. To seem a bit more professional, I wanted the return call # to be an 800 #. This will be used on my collaterall, of course, and my caller ID…and thought it would be smart to have a professional greeting to kick off the incoming that justs avoids calling my personal device directly. Thus, it’s heavy calls which should put me on the horn all day…you seemed to support grasshopper, But I saw the monthly charge to be excessive (note I don’t know exactly the minute/month since I’m new to this). Does this make sense? Are your comments then still valid for this? Got it. I asked about the industry because it makes a difference if you’re ever going to grow into creating a platform to generate your own leads in the future, and want to keep the same number. In your case, I would definitely go with an 800 provider that has an unlimited minutes plan. My comments are still valid, but I wouldn’t worry about it until you get deeper into your business. Making it complicated and overthinking it will just contribute to wasting time, and it’s easy enough to switch providers or use multiple services within 24 hours if you need to. I’d sign up for Ring Central at $25/mo, since that would give me unlimited outbound minutes to the US and Canada, and 1,000 inbound toll free minutes for customers that call in. Since you’ll be on the phone most of the time, and they’d typically go to voicemail, the inbound average monthly usage minutes would be fairly low. It’s the outbound/callback minutes that are going to be super high, which are free. The main reason I’d choose Ring Central for your situation other than the pricing, is because I’d want the flexibility of leasing a cheap VOIP office desk phone and be able to use the softphone app on my laptop, in case I was traveling and couldn’t depend on good cell service. It’s also nice to be able to use a cheap usb mic, and manage your calls on the computer or laptop from wherever you want if you like working from multiple locations. If none of that sounds appealing, or the price isn’t what you’re looking for, a cheap 800 forwarding service is your best bet. Unfortunately I can’t advise you or recommend any companies for that because I would never use one. I’m sure they’re fine to get started with on a budget, but beware of putting advertising dollars or marketing sweat equity into a campaign utilizing a free/cheap forwarding service, where you don’t actually own the number… and can’t port it anywhere without paying a crazy fee. I think there are a few forwarding services I’ve heard of like tollfreeforwarding.com, freedomvoice.com, freedom800.com, callture.com, etc… where you can get that for like $1-$3/mo, I just can’t vouch for any of them/am unfamiliar with them. Hopefully I understood your questions correctly! If not, let me know and I’m happy to help with whatever you need. Thank you…here’s another…where does a service like Vonage fit into your overall analysis for 800 #s? Hey Kenny, sorry your comment was stuck in the spam filter! Cool service business… how are you getting customers right now? Yes I haven’t finished the small business guide just yet, as I’m adding a bunch of things from other specialists to make it more thorough. I totally understand what you mean about the personal caller id… one of the reasons I talk about a lot for using a forwarding number for all side businesses. Toll free is dependent on your goal: do you just want customers to associate your brand or service (i.e.- 800-lake-clean) or actually be able to call you toll free? I would guess the former, since most local service businesses don’t typically scale beyond a couple counties in their state or origin. For your business, I would pick Grasshopper or Phonecom that I listed above in the article. Either will work great for you, and both have a free smartphone app. The only difference is if you want to add a physical office phone later on, which I’d go with Phone.com for that. Grasshopper is more than enough to satisfy service businesses that serve their customers at their location, and many people with home service companies are super satisfied with the price. Hope that helps! Any other questions just ask… you should get an email notification that I responded to this, sorry again that it’s been over a month! If you need help with your website or getting local leads, let me know I’ll write an article just for you. Have you heard of Talkroute or evoice? if so, how would you compare them to grasshopper? I just need a toll free number that can simultaneously ring multiple phones and the phones it rings can see if the other has picked up or called them back. Mainly a customer support line that multiple people can answer from their cell phones, mixed in with incoming sales calls. Maybe 2000-3000 minutes a month combined as a rough guess for usage. Thanks for the great article and for the quality answers to everyones questions. Really appreciate it. To really answer your question the right way, I’d need you to be a little more specific on your desired ring-through call flow. Specifically, do you want set extensions to do this, or you do you want a multi destination ring route that cycles through until the next available attendant picks up? The latter is easier, but I can’t tell from your question if it will create a problem/bottleneck if your sales and support calls wouldn’t be separated/filtered from the get go on the inbound call. My gut feeling without more info, would be to go with RingCentral or Phone.com, and maybe even take a look at Vonage even though I dislike them… might be the right fit for you. Definitely do not use Grasshopper for this, it won’t do what you want… and I would expect all the other bare-bones call forwarding services (evoice, freedom voice, line2, talkroute, google voice, mightycall, etc…) to be in line with that as well. How come whenever I try to signup for Grasshopper through your link, now the price is $25 dollars a month instead of the $12 you talked about before? Am I doing something wrong? Do you have a Grasshopper discount for us, it doesn’t seem to be working? Grasshopper recently switched to unlimited minute plans, and charges more per month, but no longer limits you to buckets of minutes between the plans. Hope this makes sense… before it was $12/mo and $.06 cents/min initially, perfect for people just starting out that didn’t really need much. It’s really cheaper this way because you start burning through minutes pretty quickly once business picks up, but I do understand where you’re coming from. As of now, I do not have a coupon code for Grasshopper. I’m not allowed to have one unless I agree not to promote it, which isn’t really possible for me. Sorry bud. Phone.com sends emails me new coupon codes every month for you guys though. Here’s one for 15% off if that helps ya at all!